This set starts at ($0.00) as you get to pick and choose your pieces. You must select a choice in every box to ensure you clearly illustrate what you need. Thanks! This lovely Bambini Butterflies Accessory Collection will give wings to your Little Girlsimagination and bathroom.100% Resin, these stylish pieces can be a perfect match or a mix and match, your choice! Let your kids enjoy a totally equipped bathroom thanks to this awesome accessory set. Also this magical décor, can come with our fun yet refined shower curtain which will perfectly complement the style of your child's bathroom. The shower curtain is 100% cotton. The design of this collection is ageless and will magically liven up the atmosphere. 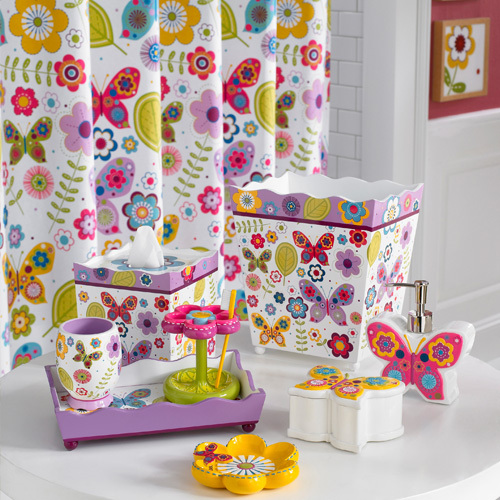 The fun patterns and cheerful colours will bring sunshine into their bath's decor. Just add each piece to your shopping cart, or simply say No Thanks to the products you don't want or need, it's that easy! Make sure you also consider our luxurious matching bath towels to finish that perfect space for your Little One. This is a custom order and may take two weeks for delivery.